Today, I am very happy to announce that we have released the official Windows vCenter Server to vCenter Server Appliance (VCSA) Migration Tool which is part of the new VCSA vSphere 6.0 Update 2m release! I know many of you have been asking for an update since we released the VCS to VCSA Convert Appliance Fling a little over a year ago. The Fling was pretty limited in functionality and this was by design so that we could quickly get something out to our customers and get some early feedback. Although I could not say anything, the VMware Engineering team have been very hard at work incorporating all of the feedback in how they designed and built the official VCSA Migration Tool that you see today. With that, I would like to extend a huge thanks to all of our customers who took part in the Fling and provided feedback both in the comments section as well as reaching out to me through the various channels. It was great to engage with literally hundreds of customers of all sizes and segments, all looking to move away from a Windows-based vCenter Server to the VCSA. Lastly, I want to thank our VMware Engineering team, both to the folks who lead the initial effort on the Fling prototype to those who then productized it! I was very fortunate to have been part of this amazing milestone at VMware. The VCSA Migration Tool workflow is quite different from how the Fling had worked which hopefully customers will appreciate. The team worked really hard on trying to simplify the overall user experience as well as trying to minimize the overall amount of downtime for the migration. In addition, we have also added full support for additional configurations and deployment topologies which you can find more details in the resource link below which includes an FAQ which I *highly* recommend folks have a look at before starting or asking further questions. Here is a quick video that I had recorded earlier which demonstrates a migration from a Windows vSphere 5.5 environment to VCSA 6.0 Update 2m, hopefully this will give you a nice overview of the migration process. [UI Demo] - Migration of Windows vCenter Server 5.5 to vCenter Server Appliance 6.0 Update 2m from lamw on Vimeo. One last thing I want to quickly mention is that this release is specifically targeted at customers looking to migrate from a Windows vCenter Server 5.5 to the VCSA 6.0 Update 2, hence the letter "m" denotation. If you are NOT looking to migrate your Windows vCenter Server to the VCSA, this release is NOT applicable to you as you will NOT be able to perform a new install and/or upgrade using this release. Instead, you should be looking at the vSphere 6.0 Update 2 release which is the exact same code base that vSphere 6.0 Update 2m is based off of. This will be even more apparent when you launch the VCSA Installer, as the "Migrate" button is the only option as shown in the screenshot below. For those planning to attend VMworld this year, we do plan to have several sessions covering the new VCSA Migration Tool as well as some other surprises 🙂 I hope to see you there and if you have any comments or feedback, feel free to leave it here or use the #migrate2vcsa hashtag if you are on Twitter, especially if you are interested in some of the surprises at VMworld. 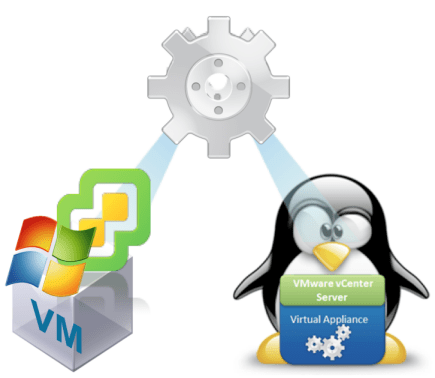 How to tell if your vCenter Server Appliance (VCSA) was migrated from a Windows vCenter Server? Windows Server 2012 fix is out for the VCS to VCSA Migration Fling! Great news – very excited when I read this. I was looking to find whether this new version would support migration from Windows vCenter Server 6 U2 (with embedded PSC) and remote SQL 2008 R2 db, to VCSA 6U2 (embedded or external PSC) ?? Thanks. We’re aware of the documentation links, they’re still being processed as we speak and should go live later today (apologies about that). The download itself is available now, but it’ll take a bit longer for the rest of the docs to go out. In this current release, we’re only supporting 5.5 to 6.0u2 migration. Basically, what we call “Horizontal” Migration (Win VC 6.0 to VCSA 6.0) is not possible as the Migration itself combines both a “Migrate” as well as an “Upgrade”. There’ll be some more news at VMworld Europe, however I will not be there but look for Emad Younis who’ll have some sessions on this topic. Look forward to any feedback you have by either leaving comment here or reaching out to either of us on Twitter/etc. Right off the bat this is a great tool. You must know though there is hard database size limit of 25 Gb when using this tool for migration. vSphere does a lousy job of purging its database of out of date information. KB2005333 deals with this. Our VPX_TEXT_ARRAY table alone was over 50Gb. Running the commands to clean this up took over 2 hrs so plan your maintenance windows carefully. Thank you William Lam and team for the Fling and now the official supported tool. Many many months of work – thanks for making this supported and easy for our customers! Hey William! Such a long road, so glad you guys made it here! Majorly excited for this as we’re staging a major upgrade in our environment within the next couple months. I’m curious, does the migration support a Windows vCenter Install with a local install of SSO server? Or ONLY an external SSO? Our installation was done with the SSO server being bundled onto the same box as the rest of the vCenter components. Ahh my bad! The links weren’t up when i asked. Thanks for the quick answer! Is there downtime required for guests when using this migration tool? Thanks William! We were in the process of utilizing the Fling 3 days before it was pulled off of LABs. We assumed there was a reason and halted our plans! But today we rejoice now that we can get away from our complicated HEAVILY licensed Windows based deployment! Please pass on a thanks tot he team from ours! Excellent. DLing now and going to upgrade my lab this weekend! Thanks for all your work on this. I might be missing something but if this only for vCenter 5.5 Windows -> vCenter 6.0 VCSA migration or does it include vCenter 6.0 -> vCenter 6.0 VCSA as well? working through phase1 following the video as a reference…….my external PSC upgrade starts fine but they stops while copying the ova and terminates. The log file states: Progress Page: [VSCA ERROR} – Progress call back error. I have tried several times now ….same result. It has to be something simple i am missing. So the error happens while the new PSC is being deployed? Is there any connectivity issues between the desktop and the target? Have you tried another system? If you’re still running into trouble, please file an SR and our GSS folks will be able to help track down the issue. Yes. The external PSC depoyment. I think i have it sorted. My lab is aging (junk). A quick reboot of everything and the wizard ran through just fine. I will be working on Phase 2 for vcenter later. Thank you for such great work. What about dVSwitches\Nexsu1000v networks? Are they migrated as well? Will a Horizon deployment continue working after the migration or will Horizon see this as a new vcenter? After the migration can the appliance be pointed to a different external Platform Services Controller? Now that I think about this I could backup the DB after migration, deploy a new VCSA connected to an external PSC and restore the DB to the new appliance. Great write-up, few questions. Q1: I assume the SQL has to be external to the vCenter prior to running the migration tool. Just wanted to confirm this is the case since I don’t see any mention of this. Q2: It says you need to setup an external VUM proior to migration. It was my understanding that you can’t use a VUM 5.5 with a vCenter 6. Is this not the case? I sort of assumed setting up a VUM 6 post migration would be the documented meathod. Q3: I’ve been meaning to do some DB cleanup. I have that issue where my vcdb is around 50GB and I believe it needs to be cleaned up. Would you recommend doing this prior to the migration/move? Thanks!! Hello William, I am a bit late to the party, but anyways. So the Fling, as per your previous post, was not able to cope with an Embedded SQL. Yet the 6.0 U2m FAQ (KB 2146439) states, that it does. I am a bit confused, so would you kindly let me know, if Embedded SQL Express is expected to work or not. Thank you in advance! Any idea on when a Windows vCenter Server 6.0 U2 > VCSA 6.0 U2 will be available? The best practice doc for the official VCSA Migration Tool refers to giving read only access to the windows localservice account on the vmware installation folders. Does the Migration-assistant verify access to those folder before the migration in case that step was not followed? Error: Newly deployed vCenter Server Appliance time is not synchronized with the Platform Services Controller. How are we supposed to synchronize anything if the migration isn’t even complete? We are using VC 5.1 on Windows 2008 R2 (physical server). Thus, I have to upgrade it to 5.5 then migrate to VCSA 6 ? And we are using SQL 2008 R2 (Not express), will possible to migrate with this tool ? Furthermore, our environment has over 100 VMs, will it impace to the migration ? Unless I hear otherwise, there doesn’t appear to be any tools, or a way to migrate from VCS 5.1 under Windows to VCSA 6.0. We are in the same boat and our architect is not wanting to take the time to go to 5.5 so we can use the VCSA 6.0 U2M. We’ll be doing the migration manually. Well, the migration tool is great. I’m hearing penny wise and pound foolish but then I’m not in a position to judge. Nice to always read your blog. 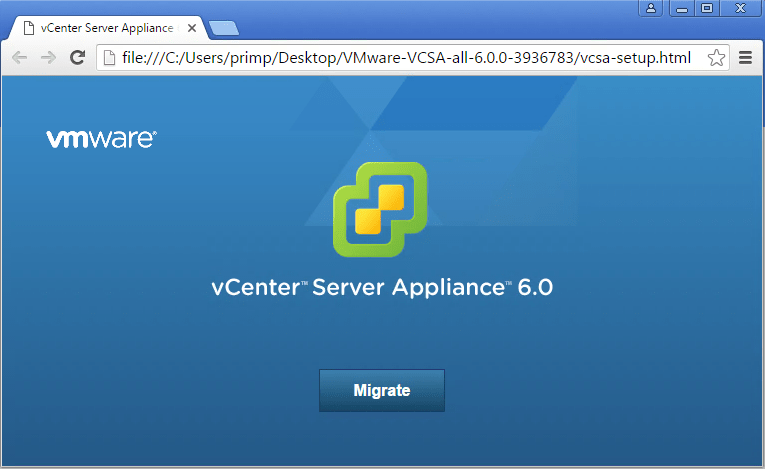 Since the article only discussing about vcs 5.5 to vcsa 6, is it applicable to migrate of vcs 6.0 to vcsa 6 update 2? We have a customer who is using VMware Essentials 5.5 with VC5.5 although they have purchased VMware Essentials 6.x with upgrade protection. They have upgraded from the VMware foundation platform 3.5 but have stopped at 5.5 as existing ESXi host/SAN hardware is not supported past 5.5. Their hosts will remain at ESXi5.5 for the foreseable future. At present the VC 5.5 is on a Windows 2012R2 physical server on which they wish to install the AD DC role so that they have a physical DC/DNS in case the VMs are down This cannot be done at present as VC is on the server and therefore is not possible/supported to install AD DC role. BTW they have 3 ESXi hosts and less than a dozen VMs. Q1, As they are licensed for v6.x but running v5.5 hosts, are they able to run VCSA 6.5 and would you migrate to that from the existing Windows VC5.5. Q2, If they migrate to VCSA6.5 or VCSA6.x will it be possible then to install the AD DC role on our Windows 2012 server or are other VM services still required to run on the server such as VUM which would stop AD DC role being installed? Q3, Would it make sense to install VCSA on the Windows 2012R2 server in VMware Workstation so that we have VC running when VM stack off-line or is there no advantage to that? Any helpful advice would be appreciated. Does this support migration and upgrade from Windows VCS 6.0 to VCVA 6.5?